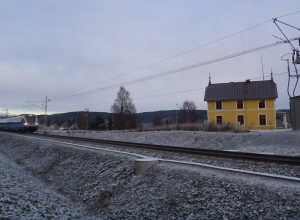 Blue train passing the yellow beauty of Bollstabruk, the former Lutheran Chapel (Lutherska Bönhuset), owned by Lars Sjöberg. Today, there are no trains stopping in Bollstabruk. The closest train station is 11 km south, in Kramfors. If you arrive to, or leave from The Höga Kusten Airport, there’s a station in connection to the airport at Västeraspby, 12 km north. That is, Bollstabruk is the cultural hub in the middle. Yes, we are a group of endangered species with roots back to 600 A.C. and with an enormous amount of potential. Yes, please. We want a train station. Since 600 A.C. our population has changed as well as our lifestyle. We travel longer distances and at a faster speed. There’s been migration and depopulation over the years. However, during the last decade the International Community of Bollstabruk has grown. Our global citizens live here all year around or during the summer months. What can I say? It’s just a great place to be, with lots of space, beautiful surroundings, relaxing atmosphere and housing for almost free. However, even endangered species mutate. Nowadays we need to travel in and out of Bollstabruk, to work, to get to the airport, out into the world and back again. We urgently need to leave our cars at home to gain environmental, economic and safety advantages. Driving during the dark and cold winter months with ice, snow and animals is quite a dangerous game. Think of it. We wouldn’t be bothering the moose, deers and truck drivers. They could have the roads all to themselves and I can think of lots of fun stuff to do while on the train. The wonderful news is that a Council meeting was held by the Municipality of Kramfors on 4 November 2013 where a petition regarding a train station in Bollstabruk was discussed. The politicians behind the petition, Clyde and his partner (I wonder if that would be Bonnie?) managed to get their petition accepted. The Development Secretariat of the Municipality of Kramfors was then instructed to contact the Swedish Transport Administration on the matter. I’m looking forward to further positive news. Way to go Clyde and partner! Pull this off and you’ll have a crowd cheering in Bollstabruk and globally. Future generations will cheer as well. Please leave a comment to cheer, in the field that opens below – ”Kommentera” – when clicking on this link. Click here and send your personal cheers to Clyde. Klart Bollstabruk ska ha en ”hållplats”!!!!! Javisst, här finns ju massor av oupptäckta möjligheter och potential. Hållplats ger plattform! Hjortron, kantareller, skidåkning, fiske, bruksvandring, kultur, party och vad som helst vi kan hitta på. Skyltlördagen igår var fin med sång och musik, försäljning och julbord på Amerikahuset. Raggmunkarna finns alla dagar. Mums. Kom tillbaka till Bollstabruk.